The Ministry of Information had the task of disseminating ideas to the British public. Its aim was to present material that would intensify certain public beliefs - in this case, to support the war effort throughout World War II. 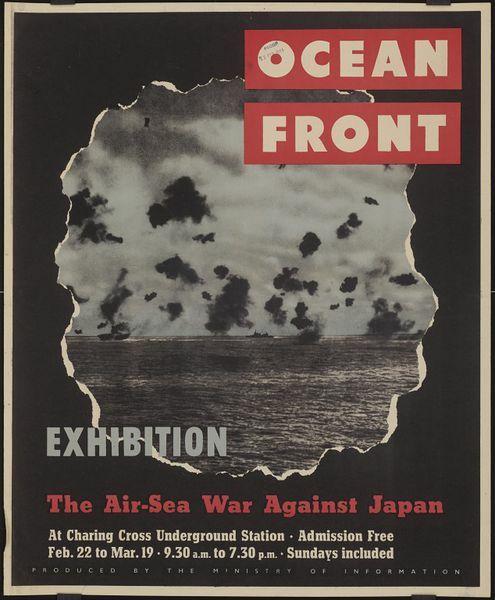 To this effect, the Ministry staged a series of free exhibitions in central London's busy Charing Cross public transport station in order to expose Britons to pro-Allied forces propaganda. 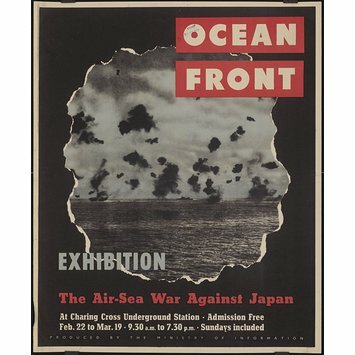 This poster shows a view of the Allies valiantly defeating the Japanese forces by air and by sea. It is interesting to note that Goebbels is said to have modelled the German Propaganda Ministry on the effectiveness of the British Ministry. Black & white photographic image of a sea battle seen through a bomb damage-induced hole. Black puffs of smke dominate the skyline and seascape. Text. Wartime propaganda exhibition poster issued by the Ministry of Information. UK, ca. 1944.